By 1902, the 72-view “Strohmeyer Set” issued by Underwood & Underwood dominated the market of Japanese themed stereoview cards. Hawley C. White (b. 1847? ), motivated to transform the stereograph from novelty item to educational tool, worked for three years developing his “White Travel Tours” and issued the first challenge to the Underwood monopoly. 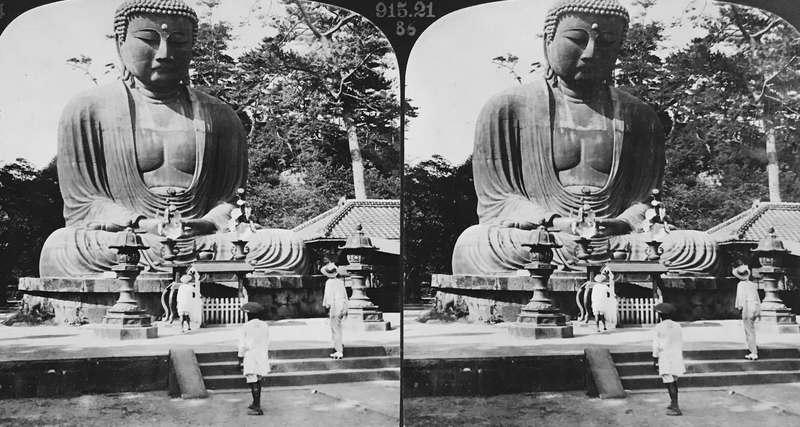 White’s “Perfec” Stereograph company would publish its first set of 72-views of Japan in 1902, replacing them with a brand-new series of 100-views in 1905. To procure images for this new 100-view series, White called upon the now-experienced stereo-photographer Herbert George Ponting (1870-1935), who was commissioned by the studios run by H.C. Graves and the Underwoods in the preceding years to produce their catalogues of Japanese stereoviews. This would mark the third trip to Japan for Ponting, who would arrive around the fall of 1904 and photograph through to the summer of 1905. Ponting would return to Japan two more times working for White and would eventually collect his reminiscences of his travels in his 1910 work, In Lotus-Land Japan, profusely illustrated by his own photography. This commissioned image on olive-colored mount shows the maturation of Ponting’s work over the years. He positions his camera in almost the exact same spot as for his Underwood & Underwood image a year prior, off-center to the left, almost at three-quarters view. The late day sun hangs low in the sky, illuminating the near side of the Daibutsu’s faces. These compositional conventions are also present in the work of Enami Nobukuni 江南信國 (1859-1929), a famed Yokohama photographer and stereographer with whose work Ponting was familiar. Moreover, Ponting seems to have been influenced by Enami’s positioning of people, thinning out the crowd of people present in his Underwood funded excursion to Kamakura. Now, three Japanese men are placed at different depths, each appearing to be in mid-stride as they walk towards the Daibutsu. This creates an effect of motion as the viewer’s eyes are drawn into the mighty bronze statue. By placing these onlookers at different depths, the stereographic effect would also have greater impact, creating a better sense of three-dimensionality and dynamism. While the gaze of the visitors is towards the Daibutsu, the object of reverence, their attitude is more casual. This is in contrast to Ponting’s earliest attempts at creating the mise-en-scène where onlookers were directed to kneel, a transparent attempt to signal piety to the viewer. Even though the men here are not Western tourists, one cannot help think that they may be partaking in an afternoon stroll to see the local attractions. The caption presents a similar ambiguity. Although it qualifies the Daibutus as “sacred,” it does not refer to the nature of the visitors; are they worshippers or local sight-seers? Furthermore, by describing the Daibitsu as a “colossal bronze image,” it underscores its aesthetic dimensions and fine craftsmanship admired by Western sightseers. The reverse of the card in imprinted with the caption in six different languages (omitting the word “sacred” in all of them, however) and a brief description of the locale. It is written in the style of a guidebook or travelogue, providing distances, historical dates, and some descriptive vocabulary. There is only the briefest passing mention on Buddhist belief, really just noting the “brooding calm” of the Buddha “musing upon Nirvana,” before continuing to describe the dimensions and material composition of the statue. It closes by advising the reader to consult with two books for more information about Japan, namely Edith Singleton’s Japan as Seen and Described by Famous Writers, published in 1905, and Anne C. Hartshorne’s Japan and Her People, published in 1902. Both are dominated by travel writing, and as such only add to the sense that viewing stereocards was presented as a form of virtual travel. For more detailed information on Ponting and White, see Bennett 2006. Ponting’s stereoviews were supplemented by Enami’s own work in both the sets commissioned by C.H. Graves and Underwood & Underwood.